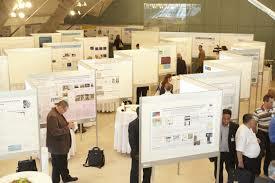 Most academic conferences have poster sessions but rarely are they worthwhile. There is a huge time investment with not much pay-off, with the end goal to achieve things that could be much easily done in different and more efficient ways. Not to mention the faffing involved with travelling hundreds or thousands of miles carrying a bulky poster tube. This is part 3 in my series about the many bad parts of academic conferences, also see Part 1 – Presentations, Part 2 – Social events and Part 4 – Value for money. I would say a ‘good’ poster takes at least a day or two to put together, then printing is usually an expensive and potentially stressful task. This is a fairly substantial amount of time devoted to something that maybe only a handful of people will read, if you’re lucky. Even then it’s very easy to make a terrible poster. Don’t get me wrong, I’m probably guilty of this too. My point is that it’s very hard to make an effective poster, there’s also no real opportunity to get honest feedback because people will always tell you it’s “nice” regardless. Poster sessions are usually timed to fit in with coffee and lunch breaks, which are frequently cut short due to the presentations over-running (for the problems with presentations see Part 1 – Presentations). With little time for a break between 3 hour slogs of presentations we have the option of taking a breather and chatting to people, looking around the posters or standing by our own posters hoping someone comes past. This just stinks of bad organisation. At conferences we usually have the choice between this and a chat, or the poster session. After sitting in a room listening to 3 hours of talks I think the choice is fairly straightforward. Ask yourself: can you honestly recall any posters that have really stuck out in your mind? I can think of a couple myself, but the only reason I remember them is that there was someone there to guide me through their work. People generally don’t stand by their posters, and rightfully why should they do so? This fits in with the poor organisation point. Even more, if you were to find a piece of work you were interested in chances are you’ll never find the person to chat to them. This is made worse by nobody putting any contact info. or a picture of themselves on. The three things I talked about above can be condensed down into one thing – poster sessions are incredibly inefficient in every single aspect for their purpose of disseminating your work. There are many alternatives that would work much better, for example a speed dating setup – 2-3 minute pitches of your work to another researcher and then move on. If it’s boring then it won’t be boring for long. If it’s not, it’s a great chance to network and socialise (another problem with conferences Part 2 – Social events). Not to mention the stress alleviated from trying to jam your poster tube into the overhead bins on a Ryanair flight. For me, the main benefit of preparing my work for presentation is that I am forced to resolve unanswered questions. When writing down the slides and imagining that there is someone in the audience who knows all the ins and outs, I leave no stone unturned and even though I might not get any real feedback at the conference, this kind of pressure stirs up my thinking on the subject and prepares me for writing a paper on the ongoing research. But yes, maybe the modern times with a larger and more global scientific community with more and more tessellated interests require a different kind of organization of conferences and networking. If the possibility of real interaction becomes close to zero, even the psychological self-preparation effect I mention will vanish.